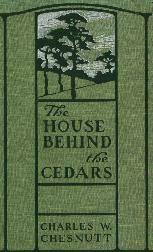 Charles Waddell Chesnutt, 1858-1932 The House Behind the Cedars. Boston; New York: Houghton, Mifflin and Company, 1900. African Americans -- Color -- Social aspects -- Fiction. African Americans -- Southern States -- Social conditions -- Fiction. Racism -- Southern States -- Fiction. Southern States -- History -- 1865-1877 -- Fiction.